In celebration of his 20th year in the Philippine Art Scene, Michael Cacnio, an esteemed Filipino sculptor, launches another great collection of his sculpture masterpieces dubbed as Lobo. The opening of the art exhibition was held on March 25, 2011, 6:00 pm at ArtistSpace Gallery. It is located at the Glass Wing of the Ayala Museum, Makati Avenue corner dela Rosa Street, Makati City. Exhibition runs until April 7, 2011. 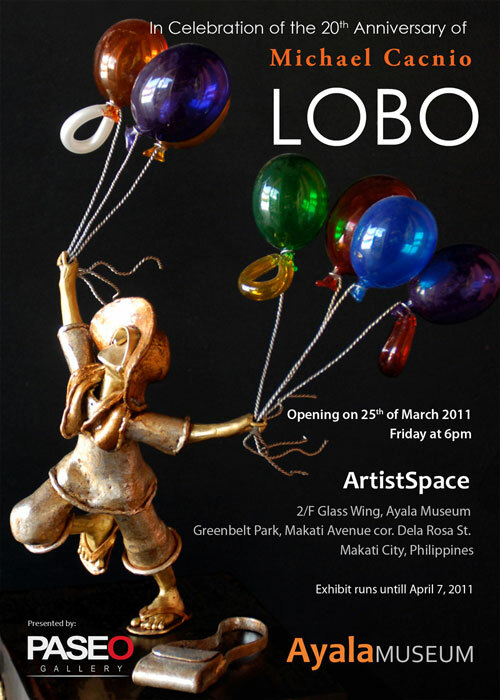 ‘Lobo’ is the Filipino term for balloon, a prominent feature in most of the pieces in this collection. Its presence may well be a festive representation, as “Lobo” (the show) is part of a series of commemorative events held throughout 2011 to mark the artist’s 20th year as a sculptor in brass. The pieces in this series deviate from the usual brass creations, in that some of the pieces are crafted in fiberglass and stainless steel. The figures molded from these materials form the context that allows the colorful glass globes in this collection to stand out and evoke a sense of occasion, of childhood joy, of parental affection, of youthful devotion, or even a juvenile aspiration for flight. The visual elegance and timeless relevance of these masterpieces make them much-coveted spectacles desired by art collectors and earnest art viewers alike. Michael Cacnio’s reputation as a pillar of social realism in Philippine sculpture was built over time through his leitmotif of quotidian Filipino scenes inspired by his childhood in Malabon. A Fine Arts alumnus of UP Diliman, Cacnio’s career as a professional sculptor in brass spans twenty years, marked by more than 50 well-received solo exhibits, an even greater number of commissioned works, and numerous sold-out shows staged here and abroad. This 2006 TOYM Awardee is the first Filipino ever to showcase his work at the Headquarters of the European Commission at the Berlaymont Building in Brussels. Recently, he was bestowed the honor of joining seven other living legends of Philippine arts and culture in Museo Walo and “The Batis Project.” His inclusion in this elite circle of world-class Filipino artists undisputedly places him as a key figure in the modern history of Filipino sculpture. For inquiries contact tel. +63.917.5268082 or (632) 728.0168.